Storm: This 12 bar progression is fundamental to all of Eric's work of this period, and up to present day. Here are some stock voicing for the three chords that make up the progression. A D E. All are 'dominant' chords. Storm: A cool move to use is this sliding riff, outlining extensions of these basic chords. Storm: Use either a clean or a distorted tone setting. Eric used both at any time. bluesman: I heard that some of his sound he got from using a blown speaker in his amp? Storm: In his early work Eric favored Vox amplifiers, driving them hard by playing at loud volumes. Later Marshalls. Buud: I saw an ad for a effects pedal to give a "bluesy" sound. Are they any good, or is a real tube amp the right answer? Storm: Can't beat tubes, I think. But the neighbors might not agree because you usually have to play them loud to get the right tone. Now the twelve bar blues progression follows these three chords, A D E. We could also refer to them as one, four and five by their position within the key. Storm: The progression starts on the I chord, 'A', before making a quick change to the IV chord, 'D'. The back to A for bars three and four. 'D' for the next two, back to 'A' for two bars. Then finishing with 'E' for a bar, 'D' for a bar, then 'A' and 'E'. The fundamental scale for the progression is the 'Blues Scale'. We want to know this forwards, backwards, up and down. The circled notes are the b5's or 'blues notes'. justin: What is an extension pattern? Storm: Extension patterns, meaning the same notes just in a different area of the neck. It is good to have one pattern for each scale that you are really familiar and comfortable with, that you can apply. justin: So if I play this, it is like playing the A blues from the 5th fret just different area of the neck? Storm: But after that, different finger positions for the same note can reach higher or lower notes, lend themselves to different licks, etc. Exactly, justin. You got it. Buud: Isn't there also a 3 octave scale that has some slides in it? Can you give us that pattern too? Storm: Here's another pattern with slides. Use just two fingers, sliding the third going up. Try going down using first finger slides. Storm: This can be a great one to break out of 'boxes'. Allows you to slip and slide your way from one to the next. And now the brother of that pentatonic guy. Storm: 'Major' Pentatonic. Maybe spent some time in the service. But still 'sweet.' Learn that tab 1 scale with the fingerings suggest. It is the basis for a lot of 'position shifting' licks. The Major Pentatonic would be a final important pattern for Clapton's sound. Major Pentatonic, Minor Pentatonic and Blues Scale - those are the important three. Storm: Now know these three scales separately for their own sound. Minor and Blues sound good over the entire progression. Major pentatonic sounds best when the progression is on the I chord, same root note as the scale root. But after knowing that, Clapton will flow between these within the same phrase. Storm: Another popular combination scale, with a namesake. Storm: I final set of shapes to brush up on are 'sixths'. Storm: Sixths can be played fingerstyle or, by muting with the left hand fingers, strummed. 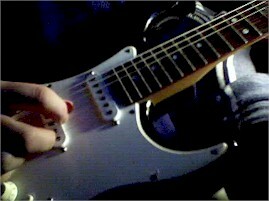 Or hybrid picking, using the pick on the heavier string and the middle finger on the lighter string. That is kind of a slick technique to incorporate. Storm: Sixth refers to the distance they are apart in the scale. An interval. The scale for these chords is the Mixolydian, or dominant, mode. You can learn the names or just recognize the sounds. Storm: That's all for this lesson. Next lesson, Clapton riffs from his Yardbirds and Bluesbreakers days.